Titthibhasana on balasana. Firefly on child's pose. Known for her curiosity, playfulness and nurturing style, Poh offers yoga practices that cultivate spacious presence for the busy, modern life. Poh comes to yoga with a PhD in biochemistry and a career in intellectual property. A corporate yogi, her personal practice revolves around nurturing body, heart and mind towards homeostasis as she navigates a demanding world. This is the flavor of her yoga classes. Poh teaches from the heart and offers her unique blend of attentiveness to healthy alignment, courageous + compassionate self-inquiry, and deliberate relaxation. Typically, there's a splash of Bhakti and she sings. Yoga is a come-as-you-are party. Poh invites you to honor your truth in the present moment, and to breathe, heal and play. She encourages you to be your own best friend. Join her for group classes at Namaste Yoga + Wellness. Because yoga is not one-size-fits-all, Poh also offers private sessions in the San Francisco Bay Area, helping clients move forward in healthy ways. Poh specializes in back care, neck + shoulder care, cancer wellness, and guided reclining meditation. With ongoing studies exceeding over 1,000 hours in training, Poh is a Yoga Alliance-certified teacher at the E-RYT 200 RYT 500 level. For a complete list of trainings, visit this page. Poh found yoga in 2003. What started out as a self-care practice for stress management and for healing from scoliosis and osteopenia became a method for joyful living. She was encouraged by teachers Eden Goldman, Gerhard Gessner and Rachel Krentzman. Coupled with her Passage Meditation practice, she was inspired onto a path of service, to help others heal and feel whole again. These days, her journey continues with Lakshmi Norwood, Vickie Russell Bell, Chandra Easton, Ashley Sharp, Ann Dyer, and Jin Sung. Urdhva dhanurasana at Princeton University. 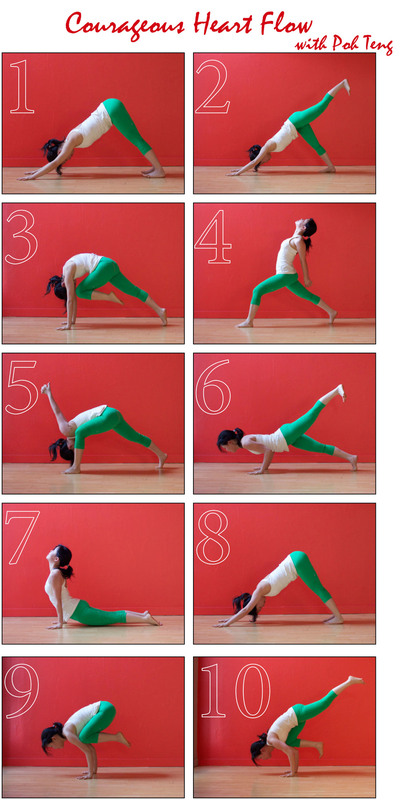 A vinyasa sequence to eka pada bakasana (one-legged crow). Poh believes in your potential more than you do. She remembers your progress better than you do. In Poh’s class, you are not only under her tutelage, you are also under her care. As teacher, she does not disguise her vulnerability, declaring when a pose she is modelling is pushing her to her limits (‘I am shaking right now!’) or admitting when something is beyond her current practice. She openly confesses her status as a committed yoga student, and shares story of her challenges and breakthroughs.